Another name would be receptionist or administrative assistant, there are many titles for the first line of contact when calling into a company, but whatever the title this is one of the most important positions in any company. I am the gate keeper but I am not here to keep you from whomever you want to speak with on the contrary I am here to help you accomplish whatever it is that you are trying to do. In order for me to do this, I will need your help, I will need to ask you questions and I will need your honest answer because although you may think you know who you need to talk to there may be someone else that can better assist you. As you are aware many companies have gone to the cold impersonal automated phone systems that can put you into an endless loop of press 1 for this or press 2 for that. How many times have you gotten frustrated and just hung up because you have been on the phone for 20 minutes and have yet to talk to a human. When you do get a person answering the phone they are there to help you and not to stop you from your goals. This first call will be the first impression the company will have of you. You will make many more first impressions, in fact you will make a first impression with each and every person you talk to. First impressions are very important; they can make or break your objectives when calling in to a company whether it is to get in touch with a hiring authority on a job posting or just calling in to inquire about some business you need to conduct. The more cooperative you can be with the receptionist, the more likely they will be able to assist you, the other side is that they do not need to know the details of why you are calling in, they just need the “cliff notes” version remember they are answering the phones and most likely they have another call on hold with another call coming in all the while you are talking. ~ Know who it is you want to talk to, at least the first name. If you don’t know the name of the person you want, then try to be clear on the reason for your call. ~ If you are returning a call, make sure you listen to your message before calling back and write down any pertinent information you might need such as the name of the person who called you and the reason for their call. ~ If at all possible don’t call from a cell phone. I know that society is moving towards that mobile world, the sound from a cell phone is often crackling and calls can easily drop. If you do have to call from your cell, try to have a full charge and if possible move to an area that does not have a lot of background noise which will distort the information you are trying to pass on. ~ Identify yourself and why you are calling. ~ If I ask a question to clarify some piece of information please answer the question clearly, more information is not necessarily better or more helpful. ~ Speak slowly and clearly. When you call in you know who you are and who you want to speak to; however I don’t know who you are and what your connection is or will be to our company. If I can’t understand you I will have to ask you to repeat yourself and that is frustrating for both of us. ~ Be courteous to the person on the other end of the line (this goes both ways). This will be the fastest way to achieving your goal. 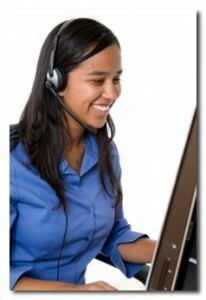 The receptionist’s job is not an easy one; we are a key player in any office running smoothly. We can be your best friend or your worst enemy, we won’t intentionally stop you from reaching that person you want to talk to but without your help and the information you hold we can often stop you without knowing. Help me help you achieve your goals, and please don’t make me be the gate keeper.